DISCLOSURE: It is Cocktails, 365′s policy that it always disclose when we receive samples of liquor to review for the Website. As we tell those who offer samples: we will accept the liquor for review, but that does not guarantee a positive review. Listed below are the opinions of Cocktails, 365 and no one else. And always, thanks and drink up! So, the Tasting Panel Magazine has declared 2013 as the year of artisan liquors. On the cover of the magazine’s January issue they featured TATRATEA – a tea-based liqueur that only recently began distribution state-side. Now, we tend to be suckers for good design, and these bottles were absolutely gorgeous. After reading about the cocktails that were mixed up for the magazine, we decided we had to get our hands on a couple of bottles. We reached out to the Karloff Tatra Distillery and they were kind enough to send their full range. Well, full range at the time. A coconut version was released shortly after we received our bottles and we have not had a chance to review it. However, we do have a review of five of their range. What better way than to divvy them up across this week? When you visit the High Tatras and their “outlaw Tatra chalets”, you will be offered as an aperitif the local specialty: hot tea made from Tatra herbs drenched in concentrated alcohol. For many years, we had been thinking about the idea of bringing this specialty to every home and business premises in Slovakia as a consumer product. The time for this idea’s fruition came in 2003, when TATRATEA started to be produced. After one year of development, we introduced our TATRATEA 52% Original to the market at the beginning of 2004. Consumers have grown so fond of it that it is now becoming the Slovak national drink. In non-marketing lingo, that means that the whole line of TATRATEA are (as the name implies) tea based liqueurs. They’ve handily divided them up based on alcohol content with the newest Coconut TATRATEA bringing up the lightest at 22%. 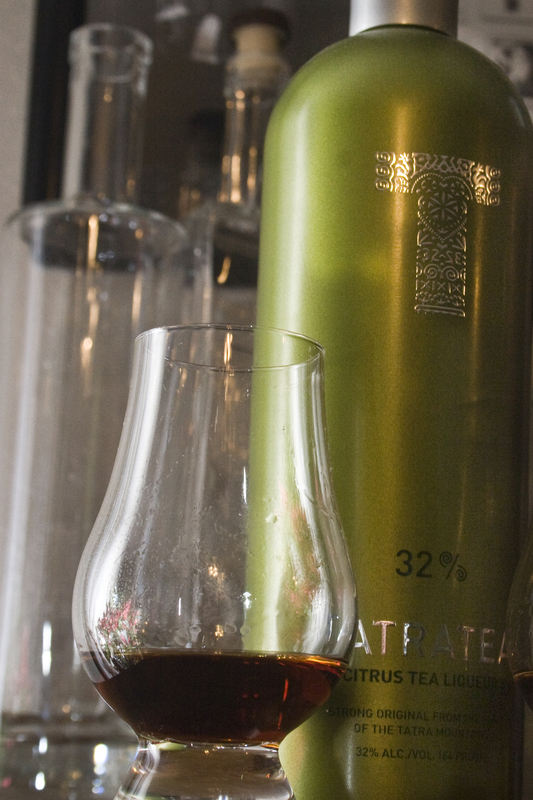 We’ll start these reviews with what we have – the TATRATEA 32% Citrus Tea Liqueur. Don’t let the green bottle fool you. This isn’t green tea in here. It’s still black tea. However, it has the lightest alcohol content, and is coupled with citrus oils from lemon and lime. Distinct, strong black tea scent. There’s an alcohol scent in there too, followed up by the fruity citrus. There’s a pleasant herbal quality to the smell. Black tea up front, sugary in the middle, finishes with a nice bite and the citrus flavors. Definitely strong on the tea flavor, so be warned. If you’re not a tea fan you’re not going to like this tea liqueur (shocker). If you are, however, you’re in for a pleasant surprise. It has a clean finish without being overly sugary. Tastes more like a spirit than a liqueur, which is a plus in our book. The addition of water takes some of the bite off the alcohol and takes the black tea flavor back a bit. The citrus really comes out with the addition of ice. This stands up rather well when taken in pure spirit form. Like we mention above, if you’re not a fan of tea, steer clear of this whole week. However, fellow tea fans rejoice – there’s finally a boozy option while you sip your Earl Grey! For TATRATEA Citrus we decided to make a cocktail that would play up the citrus bite while helping bolster that somewhat low alcohol content for a bit more of a kick. 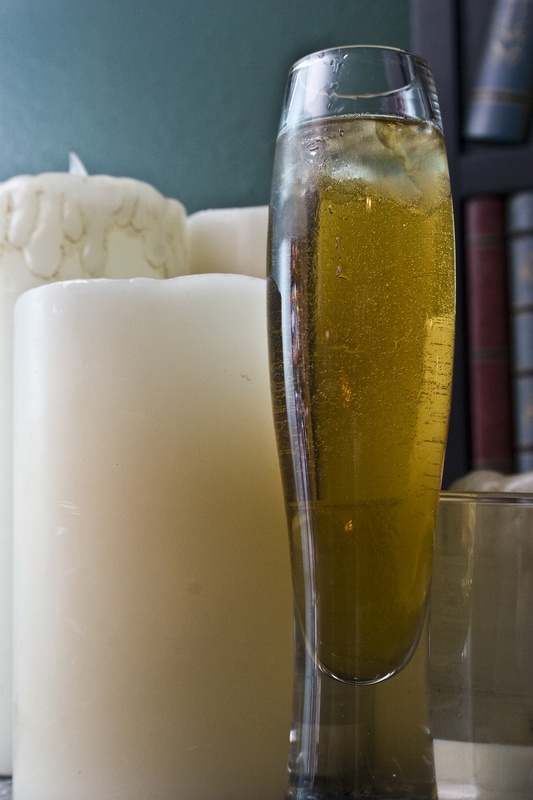 We’re playing off the classic golfing drink of lemonade and iced tea, known as the Arnold Palmer. Place four to give crushed ice cubes in the bottom of a champagne flute. Poor the TATRATEA on the bottom and then top with the Nuvo Lemon Sorbet. Allow the citrus to mix the drink for you and sip. This brings out the citrus in the TATRATEA, but helps give some weight to the usually super-light Nuvo. Looking forward to this all across the United States in 2014!